This referring to GM’s primary focus on trucks, SUVs, and car ownership. However, this is not to say that the company isn’t preparing for the future and taking innovative risks. The Chevy Bolt EV is the perfect example. Barra says that the Bolt will blend the way consumers use cars today with how they will be used in the future. She calls it a “platform” for cars 5, 10, and even 50 years from now. GM Chairman and CEO Mary Barra sits down the WIRED executive editor Scott Dadich to discuss the Chevy Bolt EV, autonomous cars and the future of personal mobility during the 2016 WIRED Business Conference. She believes that it can be seen as a conventional car like any other, however it functions as a “laboratory” for the future. The Bolt will help to encourage the needed development of charging infrastructure. It will drive itself at some point. GM worked with Cruise Automation to make an autonomous version of the Bolt that Barra had an opportunity to test drive. Barra believes that the Chevy Bolt EV will change Detroit. 155 Comments on "General Motors CEO Discusses Chevy Bolt EV – Video"
I wonder if GM will ever put a Charging Network …….L M A O.. If you could get gasoline out of a faucet in your house, no one would have ever put up gas stations. Part of the allure of a 200+ mile ranged EV is that you don’t need to recharge on the road. You can do it at your house or at the location that you stop at. GM isn’t in the infrastructure business, amd there’s no reason that it should enter it. Also you forget long distance travel. Not exactly, if you don’t have the ability to connect to a charging infrastructure, you simply don’t buy the car. I don’t think GM has ever proposed that the Bolt is a car for 100% of the people. If it simply doesn’t work for you, don’t buy it. Thank You goaterguy….These guys are so Smart! But not everyone has a garage for an airplane! Sarcastic mockery of the previous poster who whined that not all people have houses with garages. CAn you buy a $1,000,000 Supercar? Just like you cannot (unless Lady Luck gives you the PowerBall numbers), there is a market for every type of car. Most who travel less than 50 miles a day and have a garage can and probably will buy a 2017 Chevy Bolt EV. It seats five, has a flat floor and quite a tall roofline for easy entry and exit, and can recharge overnight while you sleep. And that will make the Bolt EV successful. You don’t need a garage to charge an EV. You just need a plug. No one has said that an EV is the best way to travel long distances. The simple truth of the matter is that they’re not. The attempts to extend range to 300 miles and charge a battery in 15 minutes are compromises against the majority of the vehicle’s usage. The push for larger batteries degrades fuel economy and the need to charge rapidly degrades battery life. A airplane, train, or large SUV are the best ways to travel long distances. Full stop. On the same note, no one says that bikes or feet are the best way to travel long distances, or walking, but people still bike and walk hundreds of miles from time to time. Its just not an entertaining enough story to tell people who don’t care. That’s not how people view cars in this country. They buy for the delusion in their head, not for what they actually do. Statistics say average commute is Y miles round-trip – doesn’t mean that, for mass appeal, the car-buying public at large is going to buy a car with range of 2 x Y + (margin). No. They are going to buy the most range that they can, or not buy an EV at all. few people are going to buy a car that meets 90% of their needs when they can get a less expensive car that meets more than 90% of their needs. that’s not delusion, that’s common sense. i have taken only 1 long distance trip in my chevrolet volt, but as i didn’t plan the trip when i bought the car, i would never buy a car that didn’t allow me to do unplanned travel. Strange. I don’t have a garage but I have charged my Volt everyday for four years without a problem. What percentage of trips are over 200 miles? 0.0001%? Take a plane, train, or rent a gas car. you would be surprised at how quickly you could burn through 200 miles of rated ev range in a major metropolitan area that is in a cold climate zone. the bolt is a kind of evolutionary experiment to advance automobile technology; but the core business isn’t going to suddenly evaporate. but 30, 40 or 50 years from now, today’s core business may very well evaporate; it will almost certainly be very different. This is the CCS DC fast charge network today. And Hundreds are being added within months. Note the Bolt EV uses the SAE CCS DC fast charging network. how long does it take to fill a gas tank? compare that with how long it takes to recharge an electric vehicle. now pretend that you aren’t an ev enthusiast consider how that comparison might influence your preferences. then you might better understand why berra stated that bev’s are not going to be a core business for gm. Generally depends on where I am going and what station I go to. The only stations around my house have really low quality gas. So once I drive 10 to 20 min out of my way to go to a gas station then wait in line to get to a pump then fill my tank I would guess 20 to 30 mins. I agree with your basic premise, but disagree with your examples. Neither the highway system, or gasoline infrastructure was built/funded by automobile manufacturers. Roads are public, and fueling stations corporate but separate. I credit Tesla greatly for it’s rather unprecedented building of infrastructure precisely for that reason. Lobbying is not the same thing as actually funding and building. Yes, “RLY”. In fact you are reinforcing the point I made. They hired political lobbyists to influence the federal government in their favor, which is quite different (and far less expensive) than doing it themselves. Most companies hire lobbyists, including Tesla. And GM makes more money keeping the anti-direct sales lobbyist (kill Tesla), than they do hiring the electric infrastructure lobbyist. Got it. J1772 is relevant. It can go up to 80 amps but only is putting in 10 kW inverters in the car. Most are just putting 3-6 kW inverters in the car. With a larger inverter you can charge faster at home and any place with 220. Then GM should invest in providing an air conditioned room with cots so people can take naps midway between Los Angeles and San Fransisco. Alternately you could increase your intellegence, but I suspect neither solution is practical. Totally agree with you Mark. It’s infantile to complain about GM not building charging networks! Who said anything about GM building a proprietary network? The Bolt needs a 100kW+ charging network, or it will *not* be a mass market car. It doesn’t have to be GM-only, but it does have to be waaay better than the current CCS network in terms of speed, reliability, and coverage. I bought a Leaf because I have solar and I have 240v in the garage. My wife has a big SUV that I now drive because I never get to drive my car. She wants to have a car for long distance because we go to LA from S C Az twice a year. If she would only listen we could rent a car and get rid of a vehicle that gets 15 miles to a gallon and takes up a big part of the garage. Well in any event I wish I can have my car back but she’s bigger than me , and who says we can’t have 2 EVs ? Guess who. Why would they? VW will do it for them, since they are required to spend $2 billion on charging stations installations as part of the dieselgate fallout. That agreement was with the German governmen, not in the U.S. VW will do like all the other EV manufacturers (except Tesla Motors and Nissan), which is to support the SAE J1772 standards for Level 2 AC charging and CCS or DC fast charging, which will be cheaper to install and more common to find than any private “supercharger”. Is that true. Please provide a source. This could be a game changer! Unless VW decides to build hydrogen refueling stations or CNG stations, a bunch new EV charging stations will be built….and probably fast charging stations, since VW supports the CCS standard. And no, VW can’t build out some proprietary network ala Tesla, since the agreement forbids that. the bit about the $2 billion being used for fast charging infrastructure was just speculation on the part of the writer of the article – it isn’t actual fact. without knowing the details of the agreement, i would expect that any money spent by volkswagen would be spend to advance the interests of volkswagen. i would not expect volkswagen to spend $2 billion so that you can have a charging station at which you could recharge a tesla for free. i refuse to buy an iPhone until Apple will rollout power outlets across the country. Done! The outlets are installed as part of the rural electrification plan. You can’t rely on third party outlets. Are you crazy? What are you going to do – actually head outside the house risking phone anxiety in case your phone runs out and the outlet next to you is broken??? People want hours of charge and they want Included power that Apple can charge upfront for 2 years. GM is a much smaller place than it was 70 years ago, and seems to be doing as much as anyone promoting EV’s. Tesla of course is doing alot (although there are almost zero sales near me). Ford is selling plenty of their 19 mile range Energi products. But there are several car manufacturers that either hate electric cars, or just pay lip service, – and certainly haven’t done what the former list of companies has. Is it really so bad that GM has decided to leave a standardized charging system to someone else to make, since they want to go with their home strength of providing high value EV’s? I personally definitely want a Bolt, but if the CCS optional jack is too pricey, I’ll stick with the plain-jane J1772 only. There is currently no infrastructure within the range of it in my part of the country anyway supporting Chademo or CCS. I feel this car will sell very well, provided Gasoline prices rise back to their traditional levels. if a charging network is one of your requirements for an auto manufacturer, then tesla is your only option. how many of those stations are owned by gm? None and that’s the point. How many gas stations are owned by GM? There are a few independent organisations that see a business case in EV charging. And they are developing a DC fast charge network faster than anyone else can. The majority of the automotive industry is standing behind the SAE charging standard. And independent organisations are also betting on that standard. GM has 4000 dealerships. If 1/4 of them install charging stations for Bolt inventory/owners you will have a charging network larger than Tesla in 3 months. 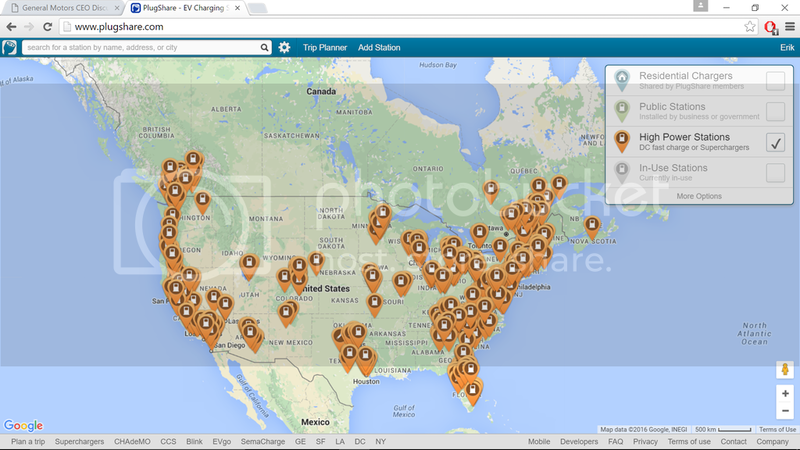 There is already a combo CCS/ChaDeMo charger every 25 miles between Boston and DC. Most of them have been installed by EVGo in supermarket lots in close proximity to highway exits. The market is already taking care of charging infrastructure. There is no requirement to look for chargers built by your automaker. That is the beauty of an open standard. It might take a little longer to catch on, but it is far superior in the long run. I don’t even need to think about gas stations when I drive a conventual car due to standardized payment and ubiquitous install base. Tesla is much closer to this model than any smaller EV infrastructure providers. Even worse, Tesla’s vehicles have assess to a super set. All super chargers plus CHAdeMO. The Nashville Tennessee SC is in the Tesla Dealership same is true of 1 of the 2 Atlanta GA stations. Not all of the SC location are right off a freeway or conveniently located near a freeway. Tesla doesn’t have contracts with 3rd party dealerships. It sells cars through their own stores. I know the word “dealership” is a common word to say when you think of a place that sells cars but there most certainly are no “deals” to be made in a Tesla store. It’s MSRP or nothing. Posing the question, dear reader, on the who the evil empire actually is. Well I think we all know the answer to that. Good Luck with the Bolt though, on your way to vaporize Dantooine. LOL, was Frankie Valli’s “I can’t take my eyes off of you” playing in the background. I remember that cab ride. As I recall you were a lousy tipper. One of the best lines ever ffbj! Notice that all car makers take care to NEVER announce better specs than Tesla. Why would they? Currently, no one else has battery packs as large as Tesla. The official EPA range for the Bolt AND the Model 3 has yet to be released, and comparing the Bolt to the S or X is ludicrous. 219 miles would be nice, but I’m hoping for something nicer. Where did all of the Nissan leaf owners go? They always seemed like reasonable people. I assume that all of the unnecessary snark and rudeness come from the Tesla fan boys. If you love Corporate Murder of your Customers, Back Room Anti-EV Lobbying, Wasting Taxpayer Bailout Money, Dragging Your Heels on BEVs, and Fighting Against Clean Air Regulation and MPG Goals– then GM is the automaker for you. Then they would not produce the Bolt and make such a big deal out of it. Mary Barra is pro-EV. So then where are the commercials and ads about it? Yeah, where are the billboards, and rockets to the moon promoting it. Get out your pitchforks! when the car is available, i would expect to see some advertisements. but the bolt is not the core business of gm so most gm advertisements are going to be about other cars. how much does tesla spend on advertising? the state of the market for electric vehicles at present is such that conventional advertising is not the most effective way to reach potential early adopter customers. so the amount of dollars spent on conventional advertising is not a big deal. Fact is, if you took all the money Government Motors got, it likely more than covers the cost of the Bolt, Spark and Volt. Their EV program is preening for the govenment, paid for with our money. Self generated gov’t bailout, that was driven by giving people what they wanted. Large trucks, and SUV’s, and the same thing repeating itself today. Sure they can ignore it, and lose marketshare to the other auto companies, and deliver $100,000 electric pickup trucks and SUV’s in your rose colored world. btw, the same gov’t bailout that preserved millions of jobs and hundreds of companies from going under. But you would probably clap if all those companies went under, and all those jobs were lost. I’m not a big fan of GM, but at the end of the day, I understand, unless they can deliver EV’s that are comparable in range/cost to current gassers, it’s business as usual. They have to think about the bottom line. Both the Bolt and Volt are awesome cars, that are heading GM in the right direction. I don’t see Ford or Chrysler producing anything comparable, and so GM should be applauded for that. They are making a difference. So I guess you’re driving around in a crazy expensive Model S/X? Large compliance car, way too expensive for what it’s worth. …and you don’t think that tesla/elon musk is self serving??? Except that he is well aware that bankruptcy will not serve our environmental cause : saving us from our scupidity burning all that carbon and wreaking havok on the climat. The odd bit for me is that Tesla is building a really compelling product that is gaining in popularity and respect on merit. And yet there are both enemies and “worshippers” spreading obviously false and biased information in both directions. Neither is good for Tesla or BEVs in general. The constant bashing of every non Tesla EV, it’s manufacturer, and it’s drivers by a small but loud number of zealots is tiresome. But can I name any great “brand” that doesn’t have such fans? Nope. I just need to keep reminding myself that the word “fan” is just a shortening of “fanatic”, and every well known “brand” has them. Amen bother amen +1 million. Nothing personal. It’s just Business. Like Dow Chemical and Monsanto and agent orange. Tesla fanboys are just butthurt that GM will produce the first mass market 200+ mile EV. They should remember that GM made an EV back in the 90s. GM have been plagued by bad management but their engineers are top notch. Bankruptcy and Mary Barra may be what GM need to finally fulfill their potential. 200 miles of range, without reliable direct current fast-charging opportunities, is the next “gimp”. At least we’re making progress. did barra say bolt responds to traffic signals? Also summary is ridiculous. Its Tesla turning (successfully) that carrier all the time since first Roadster. Panasonic can provide enough batteries for Model 3 300-500k annual sales, after it complete gigafactory. GM partnered with LG, who is 50% smaller. The Model 3 only exist as a prototype, andit will cost over $40,000 without incentives when it arrives in 2018. By thatb time, the Bolt EV will have over a year of sales, and many Model 3 reservations will be cashed in to buy a Bolt EV. Elon has consistently stated that the Model 3 will cost 35,000 BEFORE incentives. Yes, the Tesla Model 3 will be cheaper than the GM Sonic. Marry seems to gloss over that. A lot. the thing is, elon musk never said when you would actually see a $35,000 tesla model 3. the first model 3’s delivered are going to cost a lot more than $35,000. Model ≡ has been caught out on the streets testing for the past few months. Sure the “LG Bolt” will have a year to sit on the stealership lots but with how GM advertises, or lack of, usually means low numbers. GM will squander the so called “Lead”……..as usual. First Tesla has yet to meet one of it goals it has set for itself. Even if they get the model 3 out the door in late 2017 it will likely be mid 2018 before they get any serious volume out the door and no one will be shocked if they don’t get their first batch out the door until 2018. The Bolt doesn’t have to sale a million vehicles to be considered a success even 30,000 units in it first year would be considered a huge success and one of the top if not the top selling EV every sold in the US to date. Many people expect the Bolt to sale more then 30,000 it first year. Who said they had to????? The sales will all depend on how motivated the Stealerships will be to move them. My guess is the first 4-5 months there will be Stealership markups for the Bolt. IMHO, the Bolt, when the markups disappears, will sell perfectly fine. But it will have 754 miles of range and work as an accountant while you aren’t driving it, so it will be worth the money. I don’t car what the Elon promised, truth is always, what someone in the comment section says. Ray, love you but you are not making sense here. In 2018, Tesla should be making close to 6,000 Model 3 a week. If GM only sells 2000 Volts a month, they will certainly not sell much more Bolts, but let’s say 3000/months. Around 36,000 Bolts/year for GM for the first year if it’s a huge success. Now tesla will build that amount of model 3 within the first months of the Bolt’s first birthday. I think within the first quarter of 2018, there will be more Model 3 than Bolts on the road, in the US. so even if ALL Bolt buyers come from Tesla’s reservation list, it wont even make a dent in Tesla’s sales. If GM was really pro-evs, they’d offer a lot more than a Korean LG sonic rebadged Chevrolet. They sure have the knowhow to offer more. Barra stated in this interview if they need to make more BOLTS then they will. What I don’t like is my particular area won’t see them until early 2017 since California will get all the first ones, followed by NYC. The other thing I don’t like is GM apparently changed their mind on the PHEV CT6. At first it was supposed to be released this year (in 2016), but now it doesn’t even appear in the advertising literature. But I can’t harp on GM too much. At one time they did make too many Volts and too many ELRs (at least, for the price), and had to throtle back the factories. But once they get going, I don’t see it being too much of a logistics problem to produce 60 or 70 thousand BOLTS/Year if the sales are there. Judging from the high interest in a high mileage BEV (9% to 70% change as she mentioned), I don’t think it is that unlikely. And early model 3 buyers will be getting ‘signature priced’ models with all the options so, for a while at least, the Bolt will be far cheaper. Tesla has said that the Model 3 base price is going to be 35k in the US that will not include SC access, auto-pilot, or many other Telsa toys in Elon Musk own words they expect the avg selling price to be 42k pre-incentives. Initial GM said the Bolts base price as was going to 37.5k with current incentives would bring it down to 30k. However the short promo video at the begging said it would be starting UNDER 30k with incentives so the bolt may be getting a price reduction (I didn’t expect that until 2018) or they are including CA incentives who knows. Also the wording of getting over 200 miles is interesting like they don’t want to let the actual miles out of the bag. It could be they haven’t gotten their official MPGe numbers and don’t want to find themselves under a law suit or they are planing a bit of a September Surprise when the Bolt officially gets released either way I am looking forward to get more details on the Bolt. Interesting that Barra has some “all autonomous” remarks at 27:45 — this would (of course) mean that the human driver is forbidden from operating in this environment. Didn’t watch the video(at work, cannot)but the fact is Tesla is going head over heels with enhancing their SC network. I just took a trip of 115 miles(each way)on vacation in my Volt, and realized that if I were driving a Bolt EV I’d have been stuck. Although a very popular vacation destination here on the East Coast, there is almost zero charging infrastructure. In fact, what does exist are Tesla destination sites. Tesla is locating new charging sites all the time, at Sheetz’s, at Ruby Tuesdays, at hotels, along major interstates. Without some opportunity to charge, what can a driver do? Keep the Bolt EV at home I guess. GM may do a great job at developing a great EV, but may manage to make that same car relatively unimportant. maybe the Bolt EV isn’t for you. But if ou change your lifestyle to drive less, you can buy a Bolt EV and never need any recharging on the road. FOr now, keep your Chevy Volt as it will last over ten years, and help you save money now for the Gen 3 (200+ mile) Volt in 2021. Yeah, Lou should stop taking vacations. Lou should also stop reading InsideEV at work, his productivity isn’t as high as it should be. The end of May I was riding around western NC/northern GA and saw a lot of Tesla HPWCs that also had Clipper Creek J1772 systems right next to them. Simply has a post with HPWC on one side and Clipper Creek unit on the other. I have no idea if Tesla paid for the Clipper Creek unit but it seemed strange that Clipper Creek was the only brand of J1772 system where ever I saw a Tesla HPWC. Certainly no complaints as the area has a lot of Blink systems and we all know the issues with them. My best guess is that those Clipper Creek units were higher power CS-60 or CS-100 (48 or 70 amp) units that Teslas can take full advantage of. Other EVs can use them because they’re J1772 standard, but won’t use their full power. Often Tesla supplies both HPWC and ClipperCreek J1772’s for their destination charging program depending on the size of the location. Right. If the Bolt had, say, 600 miles of range, but no better charge times it would take 3 hours to charge. Now tell me how you sell a car that can drive from San fransisco to San diego but takes 3 hours to charge. Wired is a pretty crap-tier magazine. Seriously, it’s more about wanky SCIENCE! fluff pieces than anything actually interesting or truly informative. They why did you read it? You remind me of guys who don’t like the hangover after drinking, yet keep doing it. I am looking forward to more detailed information from GM about options for the Bolt like colors, leather, etc. I know, me too; and we are only like 4 months away from the California launch. I was expecting to be able to start picking or reading about option packages by now. Most dealers are also in the dark. I am hoping they will announce a nationwide version with Radar cruise control, just like the Volt got, right after the California launch. I’ll seriously consider the Bolt. But I also have a down payment on a Model III. Right now, the Bolt is a 200-mile range car that is limited to 200 miles in many, many, many places because of no fast charging network. Tesla’s 200 mile Model III will be a 200-mile range car that I can use to travel across the state or across the country the day I get it. That is a huge difference that no one in Detroit seems to understand. The Bolt with 200 mile range but zero charging infrastructure is a 200 mile range local commuter car. A LEAF works out just as well. No need for 200 mile range. Its only value is the potential of doing longer road trips. Without charging infrastructure, the extended range becomes useless. I have a 60+ mile commute. In winter (with sub-zero days), the Nissan Leaf would require me to stop and charge in order to get home. The Chevy Bolt makes commuting actually achievable. Even with a 40% to 50% loss in capacity due to weather, another 20 miles of errands after work, and a 3% capacity loss each year due to battery degradation, the Bolt still meets the bill. The Nissan Leaf, even at 107 miles, doesn’t come close. John: That was my point exactly. It isn’t the Bolt EV that I have a problem with, it’s the lack of a charging network. I really like the look of the car, and a Model 3 is probably out of my price range. If GM and the other OEM’s were smart, they’d invest in a national network…that’s where the future of EV’s lies. It’s the key, only Tesla gets it. Don’t hold your breath waiting for GM to build any type of public charging infrastructure for quick charge. GM has already stated that’s not what they will do and expects other to do it. They held that same mindset with the Bolt. EV is not what they do so they had LG design and build the full drive train, battery pack and power electronics. Actually GM did all of the design of the battery pack, motor, etc. as well as the integration of all the parts they are having LG build. GM is using LG to build parts following the blueprint from GMs engineers pretty much. The only spot where LG really was in control of things seems to be the design of the infotainment screen software/user interface. Mary Barra has already stated publicly that they’re not going to do the infrastructure. It appears they still have the old school Detroit mindset. Car companies don’t build gas stations anymore, so they think they don’t need to build fast chargers. Perfect example of someone trying to hop on a new paradigm without fully understanding it. Interestingly, the VW settlement includes $2 billion for, possibly, charging infrastructure. If VW spends even 10% of that strategically on nationwide public fast chargers, it would solve the issue. But much as I wish I could, I’m not holding my breath for VW to do the smart thing either. Something to pay attention to is that 200 mile range is not all the same. Tesla’s are designed to achieve 200+ miles of range at highway speeds. Superchargers are spaced at 120-140 miles apart to allow for that 200+ miles of range to mean making Supercharger jumps with about 80% battery and still have a buffer. The Bolt is not designed for the same use pattern. The aerodynamics alone mean that even if they achieve 200 miles of EPA range, the actual real world range will not be so good at U.S. highway speeds. Remember, EPA highway rating is done at a 48 mph average. At highway speeds, 65+ mph, a Model S is more efficient than an i3 or Leaf. It is likely that the Bolt is actually less efficient at 65+ mph than an i3 and possibly even a Leaf. Btw highway speed is 75 mph in the UK and most of Europe. So the better aerodynamics of the Model S and even better of the Model 3 are even more important for range there. The question is, when GM sells or gives EVs to Maven or Lyft, do they get the full ZEV credit amounts? The bolt will sell but it all depends on the Stealerships desire to move them. in my research on chargers it shows the maximum onboard charging is only 7kw compared to almost 20kw for Tesla’s. Also as far as I’m aware the highest capacity home charger is Clipper Creek @11.2kw. Having this bigger charger won’t help bolt charge up any quicker (since its limit is 7kw). This shows to me GM isn’t very serious. I hope version #2 has a much higher current charger built in or available options. Bolt EV is 7.2KW. Most Tesla’s are limited to ~9KW. Dual chargers that allow AC charging up to 20KW are no longer going to be available from Tesla. But you can get a 17 kw charger for the s and x as an option. 1. The Volt is not an EV. Calling a tail a leg does not make it a leg. 2. The bolt charges twice as slow as your previous EV, the Spark. At 1 hour to charge %80, that is too much. The charger wattage, 50kWh, has not improved in years. This is not an advance. 3. Autonomous driving is a toy right now, not a sales feature. It is certainly not a substitute for basic performance features like range and charging speeds or more locations. I’m not a GM basher. I paid $500 to be on a waiting list for the Bolt. What waiting list? GM has already said they are not talking pre-orders for the Bolt. btw, an Electric Vehicle, is any vehicle that can drive on electricty alone, which the Volt can. Saying it’s not an EV’s, is like saying the BMW i3 is not an EV, if it has the range extender installed. Really? That’s not the my Volt has been acting for the last 4 years! Then my 2010 Ford ranger qualifies as an EV. It plugs in (via the lighter socket), and will go several inches on a charge (if you leave it in neutral and apply the starter). Sorry, no sale. You are welcome to your own standard. You don’t understand rate of charge. GM has quoted the Bolt EV with a DC fast charge of 50KW (as this is the rate that most CCS stations currently put out) but has mentioned that the Bolt EV design will be validated for charge rates higher than that. So the car is fairly future resistant. Besides If the Model S 60 is any indication and the rumor is that the Model 3 will have a 55KWh battery it likely won’t be able to charge much faster than 50KW anyway. In the video below pay special attention to the charge rate of the Model S 60. It’s fairly quick for the first 20% but drops fairly quickly thereafter. I’ve yet to see a release date for the Opel Ampera other than 2017… so keep talking and being full of yourself gm, with your spotless track record at making some of the greatest cars on the road. What matters is deliveries and not just in the US. Almost all cars are sub assembled from Suppliers. Mary Barra makes it very clear that GM owns the battery cell chemistry. And most of the parts being supplied by LG are designed, tested and validated by GM. 200+ Mile car addresses Range Anxiety for the vast majority of people. Our Fiat can handle 90% of our daily needs, but does cause some anxiety, which my wife totally hates and bails to the ICE in those cases of days of uncertain errands. With 200+ miles range; that will take care of all non-emergent contingencies. Long range travel? It’s a plane or rental anyways. The BoLT is a unique high-value, high mileage range ev which is just what I’m looking for. It will probably *NOT* be the last ev GM sells. There is NO OTHER MANUFACTURER releasing a car as early as GM is that can do what the BOLT will be able to do, for the price. I think that is extremely noteworthy. Won’t be GM’s last EV, but the big pivot for GM will be whether they want to design and build EVs that were purposed for electric propulsion from the ground up. Or if they want to graft plug-in powertrains onto existing car and truck platforms that were originally designed around conventional ICE powertrains. From the looks of things, it seems that GM is currently more interested in adding the plug-in Voltec option to existing models. GM’s probably looking at Ford’s Energi sales figures and seeing how the Fusion Energi sells nearly as well as the Chevy Volt, even though the Volt is a superior PHEV. For now, the buying public seems more comfortable with something that looks more familiar. GM could go with a larger purpose-designed BEV platform. But, until the Bolt sales sift out, I don’t see GM pulling the trigger on more BEV-only platforms, especially if they more significantly overlap with GM’s higher volume ICE models. And I think the reliability factor will become more significant as the EV market slowly moves more towards mainstream car buyers. GM has proven that it can produce reliable EV powertrains that are also very efficient and perform well. The Model 3 will be a test of Tesla’s ability to execute at a larger scale. They’ve been able to maintain customer loyalty with good service. That quality of service has papered over the simple fact that Tesla cars have had reliability issues. Easy to invest in customer care when they buy high priced, high margin, and low volume vehicles. Can they maintain that high quality of service with the Model 3? And can the Model 3 avoid the reliability and QC problems that have affected the other models? Once the Model 3 customer base shifts over to more mainstream customers (i.e., the people who do not currently visit EV sites or drive a plug-in vehicle), then the reliability will be far more important than the high tech features and wow factor. EV reliability is a win, all the way around. Neither Tesla, or GM, are having fuel pumps explode, chronic emissions issues, or unrefined gear changes in their EVs. The reliability contrast among EVs will be made up, versus “should I leave behind the internal combustion engine?”. Reliability covers the entire vehicle, not just the powertrain. TrueDelta found that the 2015 Model S averaged 60 repair trips per 100 vehicles. That’s just about the highest repair rate in the entire industry. Once Tesla enters the mainstream market, that’s the kind of stuff that can kill a brand. If you look at some of the problem spots in the TrueDelta data, about half of the reported problems on Teslas have to do with the body integrity and paint. Stuff like rattles and squeaks, parts not aligning correctly, leaks, rust, windows and wipers not working, etc. By themselves, none of them are showstoppers, but taken together they can chip away at Tesla’s reputation and customer satisfaction. Mainstream car buyers are a lot less tolerant of bad QC and bugs than early adopters. By comparison, Toyota averages 7 repair trips per 100 cars (2015 model year) and Honda averages 13 trips per 100. The industry average is generally between 20 to 32, and Chevy is squarely in the middle at 23 trips per 100 (tied with Subaru, Audi, Kia, and GMC). Another issue that will rear its ugly head once Tesla transitions over to the higher volume mass market, my understanding is that Teslas cannot be serviced by independent repair shops. Aside from there being no franchised dealerships, Tesla also controls the distribution of parts, and does not make service manuals available to third parties. If all of the 400k Model 3 reservations turn into actual car purchases, I don’t see how Tesla can handle the servicing crunch if their repair rates remain as high as they have been for the Model S.
I like Mary Barra and what she has to say. Almost persuades me to buy a GM car again. Almost, but not yet. Electric vehicles are good for the environment no matter who makes them. I think we all agree but buying an EV that you know beforehand will be limited by charge rate and charging infastruciture does not make sense when there are feasible options such as Tesla out there. Buying an EV should not mandate that you have a second vehicle just in case you want to travel/road trip… or rent one.. It should be just as good if not better then a reg. gas vehicle. That’s the goal. Why compromise? Bolt and Model 3 will be comparably priced with M3 having the option to have access to a super charging network. Stop and think… Worth waiting for M3. I like that GM is doing an EV but cannot except that they will not support their product.